Order out of chaos. Insects are a natural part of gardening. But, all too often the habitat for these creatures is missing and so the garden goes lacking, usually in beneficial insects. Interested in how the two go together? 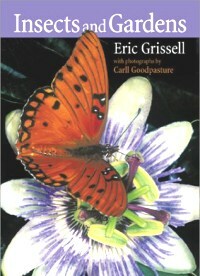 So is entomologist, Eric Grissell. He seems a little surprised to find out we are also interested. This is a fascinating look at why we need the plants in our gardens to attract the insects. Not a bug book really, because it is not full of tedious plates of one bug after another. Rather this is a book that attempts to get us to understand the delicate balance necessary to have a successful garden with as little artificial intervention as possible. His opinions are strong on how to go about this and frankly we like that. From Bees to Wasps, Mr. Grissell helps us understand how the insects live, grow, feed and die. An easy to read and extremely entertaining book with many unusual color photos. If your garden is a little too quiet or overrun by some unwanted garden pest this book can help you create a place more amenable to you by making it more amenable to your beneficial insect friends.